One objective of the St. Clair County Parks Master Plan is to preserve local history within the county park system. To meet that goal, the Parks Commission established a historic village at Goodells County Park. The goal of the village is to preserve local history that was in danger of being lost, while providing an educational venue for county residents to enjoy. All of the buildings that are in the village have been donated and moved to the park from different parts of the county. Each building has been carefully restored to its original appearance and tells a unique story, which has been documented through written history, personal accounts and photographs. The village currently consists of five historic buildings - The Columbus Bible Church (1860), Mudge Log Cabin (1863) Murphy/Ryan Farmhouse (1872), Lynn Township School (1885) and the C.C. Peck Bank (1908). The village is open by appointment and during most special events. The historic village is the perfect destination for school groups. Many of the historic village’s teaching points fall within classroom teaching requirements. Call today! 810 989-6960. Built in 1860, this “post and beam” church has been moved twice in its lifetime. Originally located in Columbus Township, the church was painstakingly dismantled, moved and reassembled in the village in early 2011. The original belfry, which was removed 50 years ago, was rebuilt to match its original appearance. The interior is currently under going restoration and will be available for weddings in the summer of 2012. Built in Wales Township by Isaac Mudge during the Civil War (1863), this cabin was donated to the historical village by the great-great-great grandson of Isaac Mudge. The cabin was completely dismantled, moved and restored by park staff over a two- year period. During the restoration, rotted logs were replaced with Ash trees that were lost to the Emerald Ash Borer. The rough-sawn flooring was also made from salvaged Ash trees. The interior contains items related to Michigan pioneer heritage and gives visitors a glimpse of life in rural Michigan during the Civil War. The Murphy/Ryan Farmhouse was built in 1872 and moved from Kenockee Township to Goodells County Park in December 1998. This modest farmhouse built by Irish immigrant farmers is a classic example of rural living in the 19th century. The house was restored over a ten-year period and opened to the public in 2009. The house is completely furnished with 19th Century Americana on loan from the St. Clair County Farm Museum. The Lynn School was built in 1885 and was moved from the City of Yale to Goodells County Park in December 1998. This was the school’s second move, the first being from Lynn Township to Yale. When the school was moved to Goodells County Park, its contents were left in place, even the pictures hanging on the walls. This completely furnished and restored one room schoolhouse gives visitors the opportunity to see what learning was like in the late 19th century. The school provides a perfect educational venue for area teachers and their students. Reserve it for your class today! Built in downtown Goodells in 1908, the C.C. Peck Bank was donated and moved to the village in 2003. The bank has been restored to its early 20th century appearance. The building is one of four banks that were built and operated by C.C. Peck and Company in the early 1900’s. During the depression, an armed robbery shootout and scandal would rock the Goodells bank and small community it inhabited. 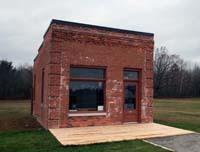 The Wales Historical Society leases the bank as a small museum that celebrates the history of the nearby townships.